Disc: Maroon label, gold print. 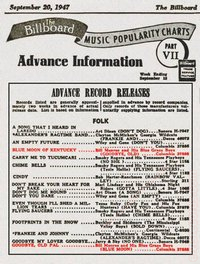 The September 20, 1947 issue of Billboard Magazine lists Blue Moon of Kentucky and Goodbye, Old Pal by the Bill Monroe and His Blue Grass Boys on Columbia 37888 under Advance Record Releases for Folk music. The image below is a combination of pages 41 and 42 of that issue. 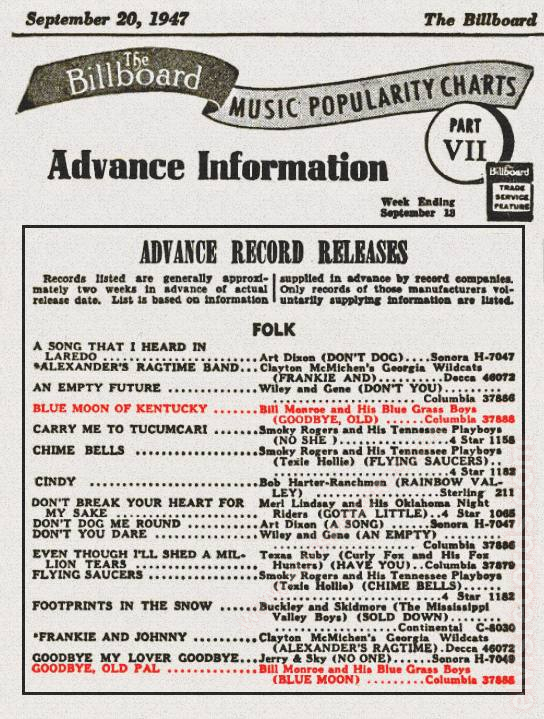 The picture to the right is from the September 27, 1947 issue of Billboard Magazine. 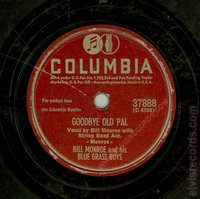 A review of this release is on page 112 of the November 15, 1947 issue of Billboard Magazine. Here it is complete with original spelling errors. 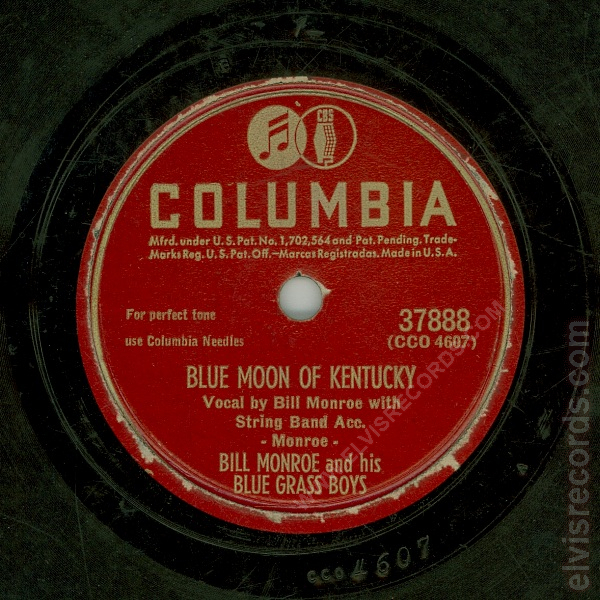 "The top tenoring of Bill Monroe, his pipes husky with the grass country flavoring, makes it a nostlagic nicety for his Blue Moon of Kentucky waltz. 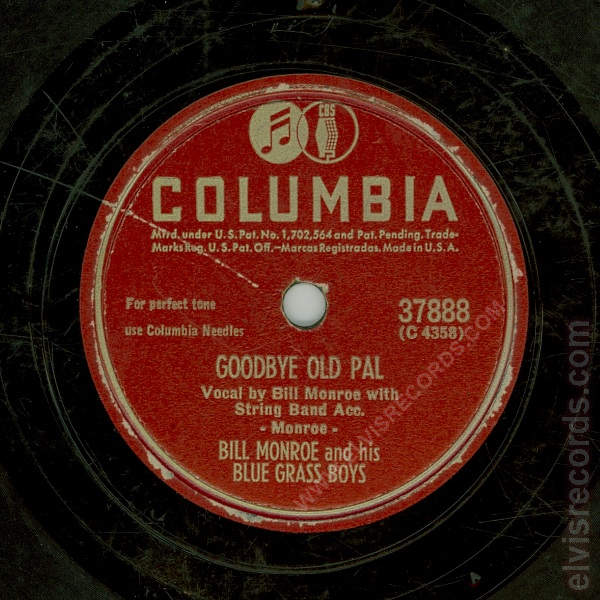 The mandolin, fiddle and guitar of his Blue Grass Boys capture the spirit of his singing in their playing. 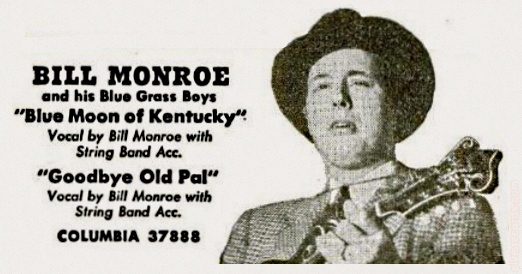 For the flip, Monroe takes it at a lively clip and adds a lick of yodeling to his old-time singing of his sentimental Old Pal ballad. For those favoring the old-time singing and playing." 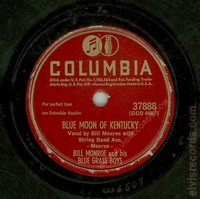 Blue Moon of Kentucky was recorded by Elvis Presley for his first single, SUN 209, in 1954.